Pétanque (French boules) is the 10th most popular sport in France and is also played by millions of French people for pleasure, especially during summer holidays where tournaments organised in the camping / holiday resorts are very common (I remember enrolling in some “tournois de pétanque” myself as a teenager). 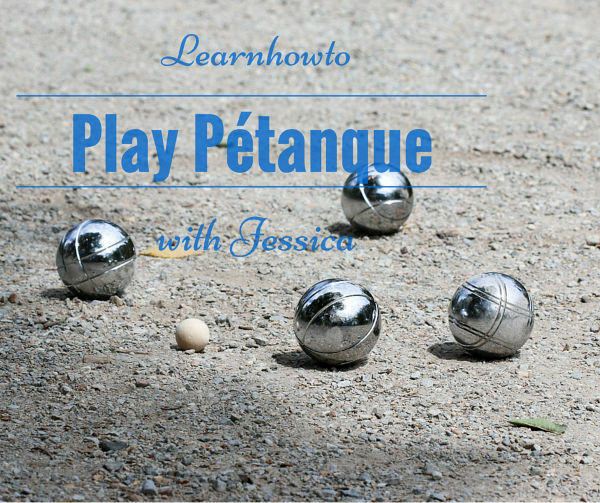 Last July, my husband and I spent a few weeks in France and playing pétanque again revived fond childhood memories. 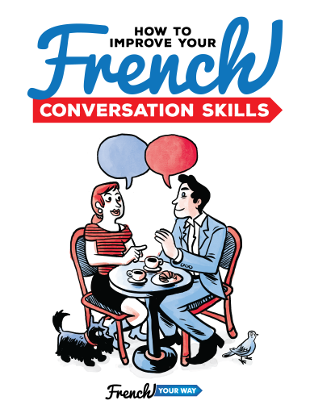 I eventually had a set delivered to Australia – the “boules” are so heavy it would have been a shame to take them back in our luggage as we would have lost some precious weight allowance, much needed for my new French books and the many packets of all my favourite French biscuits! 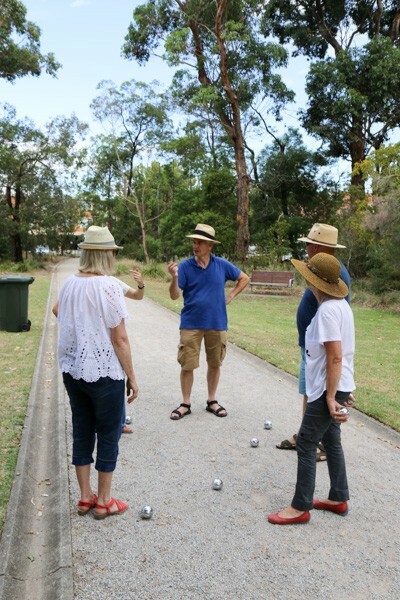 On our annual picnic in the park last February, I introduced the game of pétanque to my students. 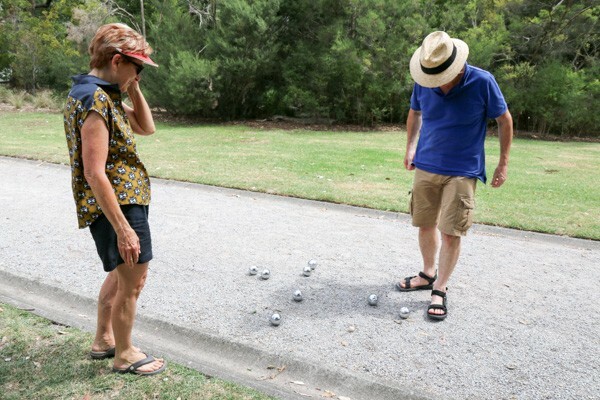 The rules of petanque are quick and easy to learn and it was great to see them get so into it, cheering, competing, debating over the score and having a good time! 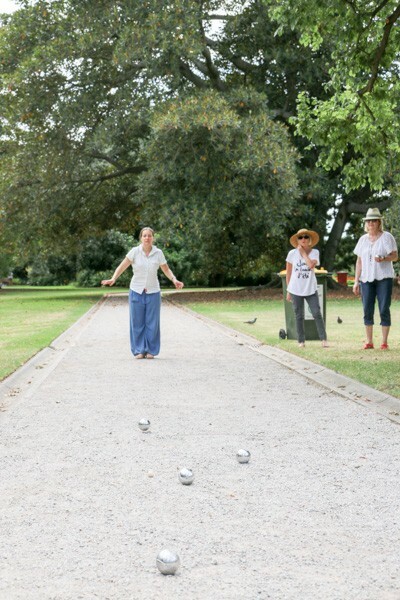 Pétanque is a century-old game originating from Provence, in the South of France. 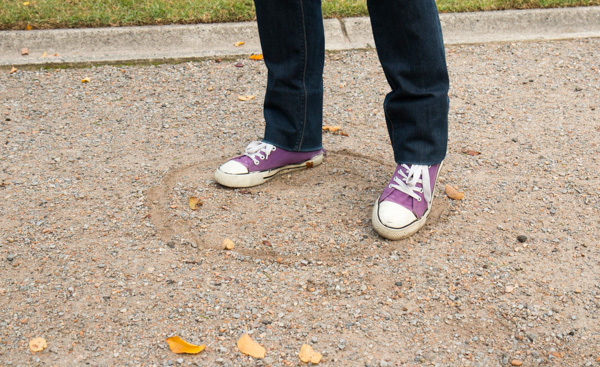 The name comes from “pieds tanqués”, which means “feet anchored / feet firmly grounded”. Indeed, in an older version of the game, the ball was thrown after a 3-step run (a bit like in a bowling game). To accommodate one of the players who was suffering from rheumatism and could not run, the rule was changed and all players had to throw the ball with both feet riveted to the ground. 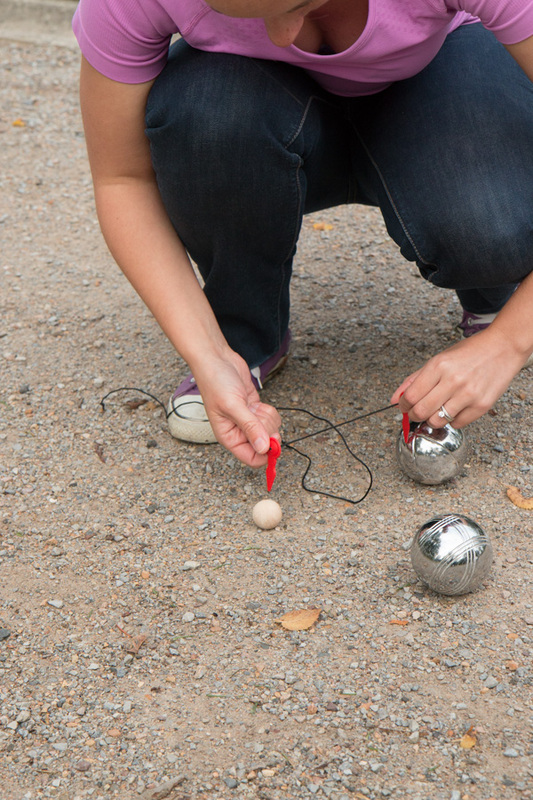 Pétanque was born ! 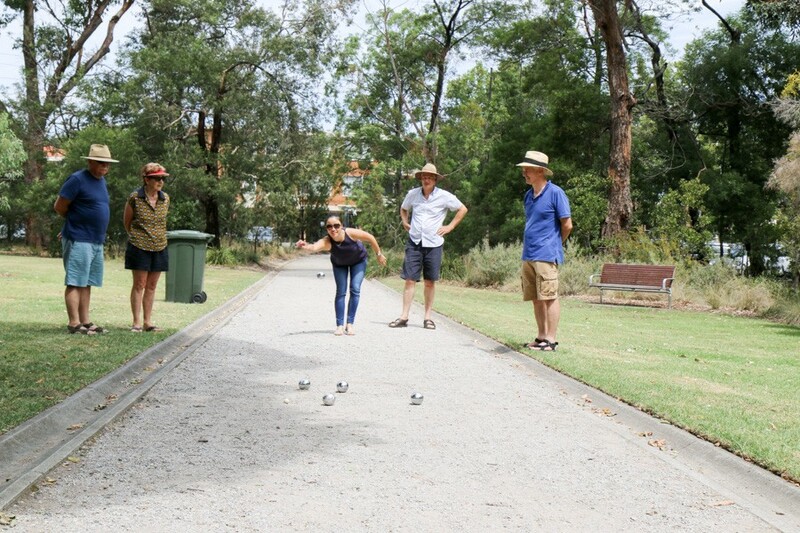 Competition boules must weigh between 650 and 800 grams and be 70.5 cm to 80 cm in diameter. (Players can have their personal preference, but the choice also depends on the size of their hands or whether they mainly use them for pointing or shooting (I’ll explain that later). 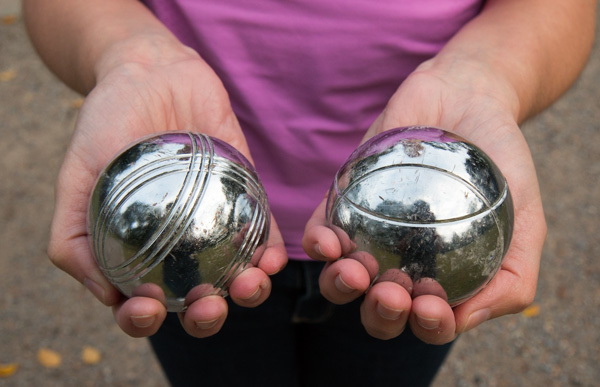 The boules have different patterns on them so we can know whose player they belong to (it’s also possible to have your initials carved on the boule). The team score points for having their boule(s) the closest to the cochonnet. 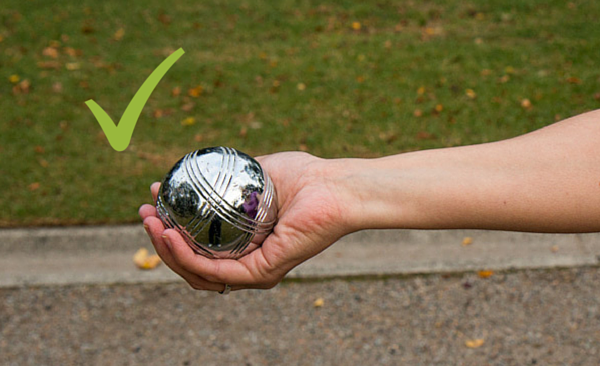 The cochonnet is therefore what you need to aim at when throwing your boule. 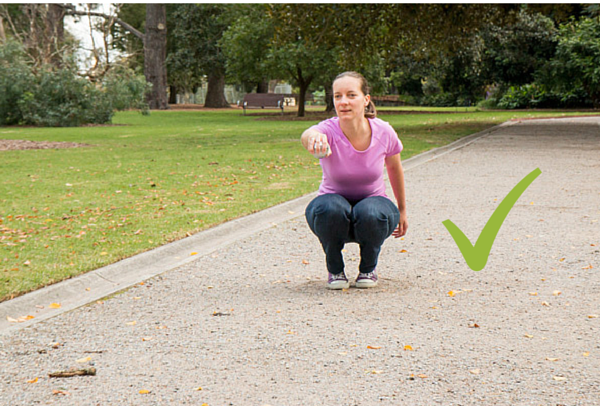 Le terrain, le boulodrome = the area/field/ground on which pétanque is played. 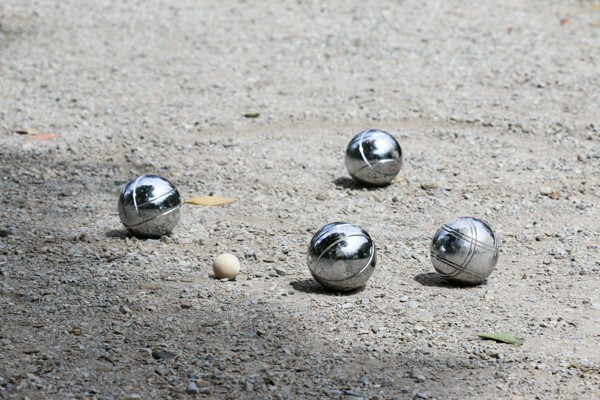 Pétanque is best played on small gravel, but can also be played on sand or grass (my least favourite, because then the balls can’t really roll). 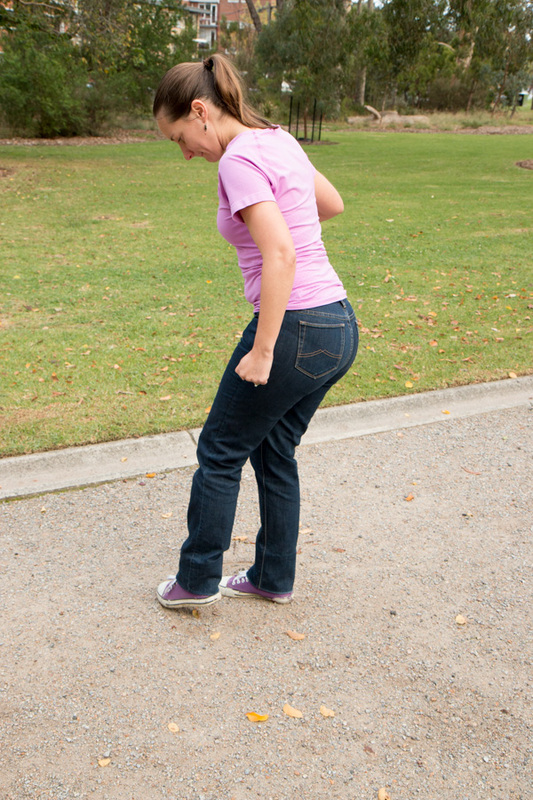 It is forbidden to touch or remove any obstacle on the terrain (a pebble, a leaf, a twig, etc). However, it is allowed to fill back an impact hole which has been made by one boule thrown before. 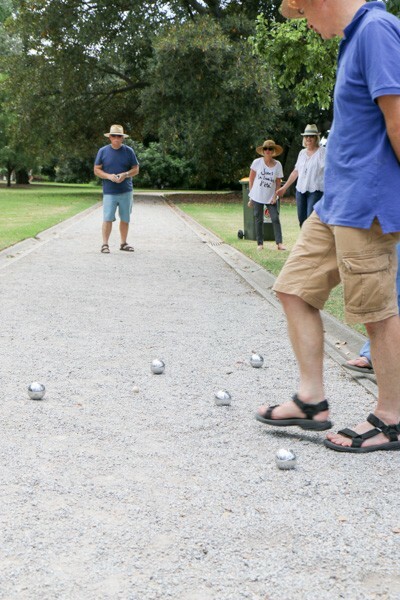 A round ends when both teams have played all of their boules. 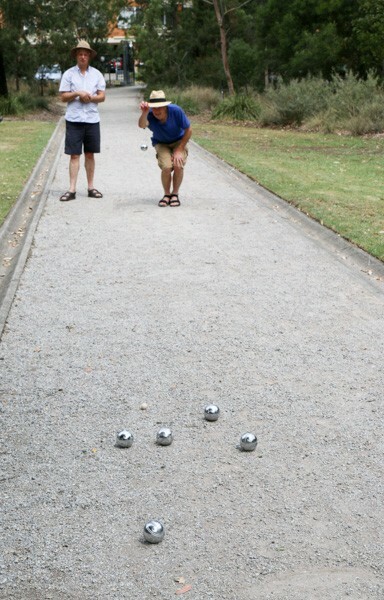 Pétanque is played in as many rounds needed for the first team to score a total of 13 points. At the very start of the game, for the first round (“la premiere mène”), we randomly draw which team goes first. 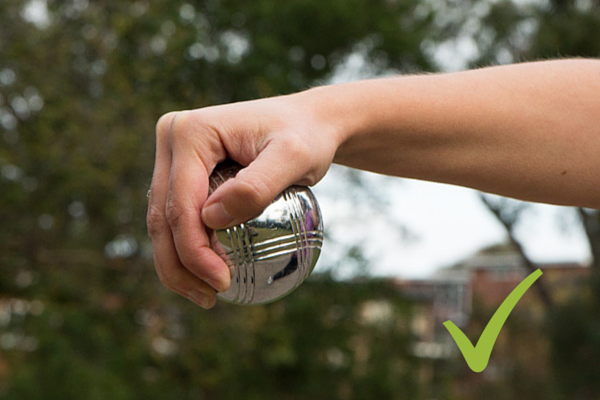 Every player will then have to throw their boules from the circle during that round (in other words, this will be the starting point for all players). 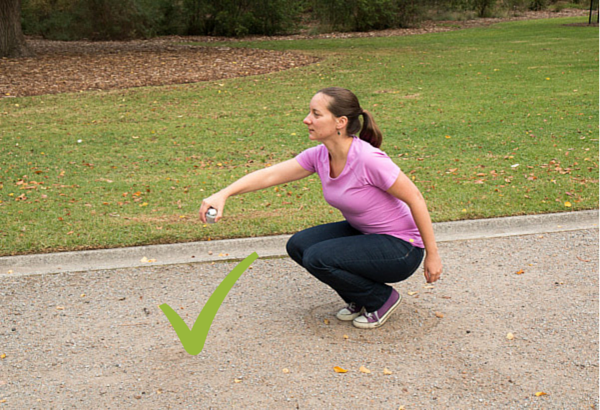 The palm of your hand usually faces down (upper-hand throw), but this is not compulsory. 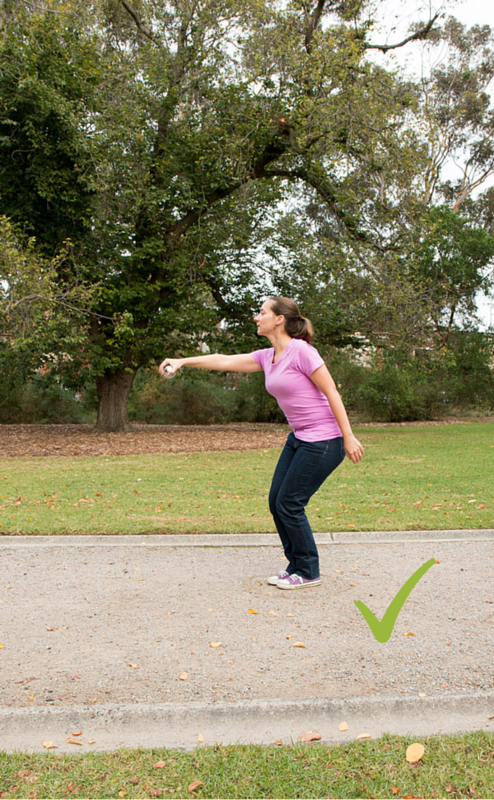 However, throwing this way will allow you to get more control when giving your boule a slight spin. 4. The opposing team also throws one boule. This way, we can see who is “having the point”, i.e which team is leading thanks to having their boule closest to the cochonnet. 5. 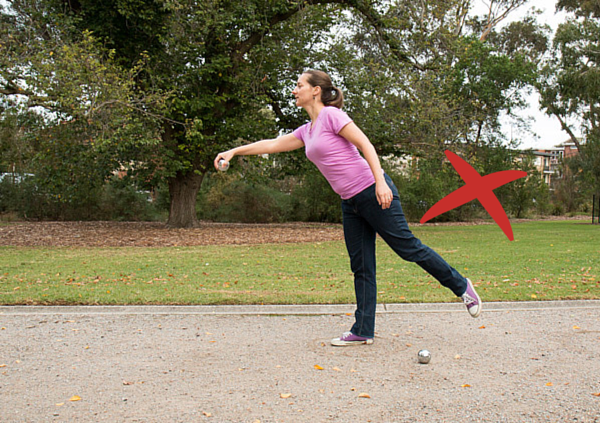 The team who does not have the point throws the next boule and continues to do so until they gain the point or run out of boules. 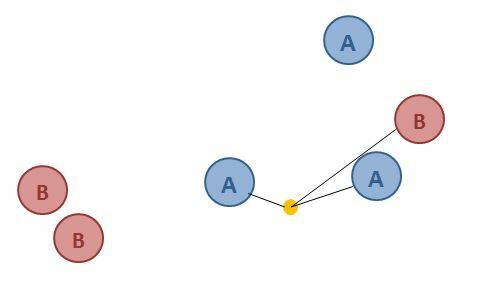 The players within one team can play in any order, depending on whether they require the skills of one of their “pointeurs” or “tireurs”! 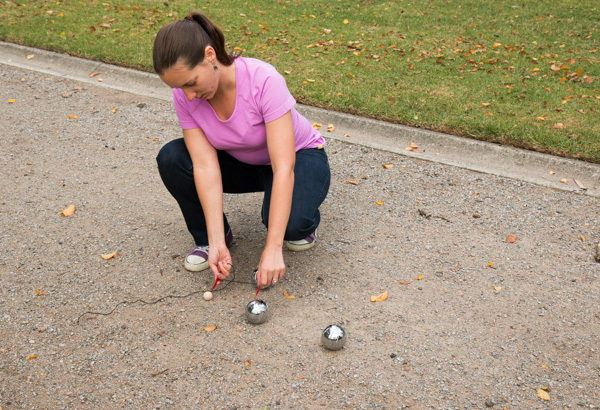 Un pointeur = a pétanque players whose task is to point / to aim at the jack. 6. At the end of an end, the team with the boule closest to the cochonnet scores one point for each of its boules that is closer than the opposing team’s closest boule. Team B is winning this round, because the closest boule to the cochonnet is theirs. 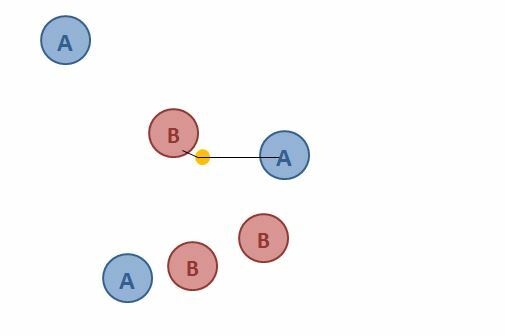 They only get one point though, because the second closest boule belongs to the opposing team. (who scores nothing for this round). 7. The starting circle for the next round is positioned where the cochonnet was on the round that just ended (so we have a new starting point). 8. The game ends when one teams reaches 13 points. 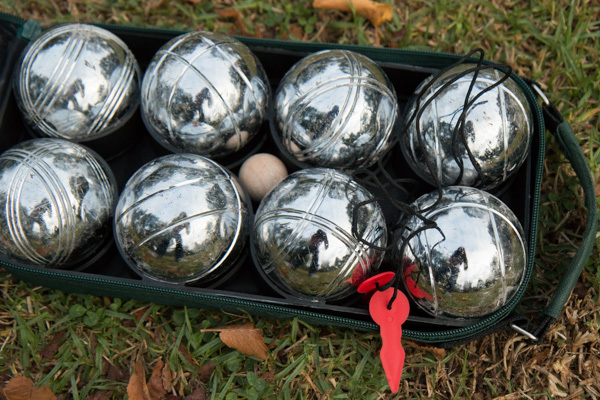 If you’d like to buy your own boules de pétanque from France, check out Obut website (Obut is the most famous brand for quality boules). 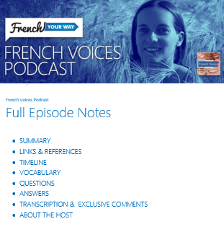 You can also have them engraved, find a glossary with more pétanque-related vocabulary, read tips on how to choose your boules and hold them properly, etc. You can also get your set of boules from Amazon here (affiliate link). 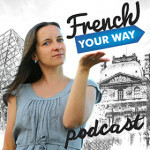 And you, have you played pétanque before? Share your last experience below!